San Antonio, Texas – In 2011, Sen. Dan Patrick voted for the budget that slashed over $5 billion from Texas’ education system. Then, in 2013, Patrick voted against the budget that partially restored funding to Texas’ neighborhood schools. Today, State District Judge John Dietz ruled that Texas’ system of funding neighborhood schools is unconstitutional. However, Republicans and Democrats alike can see through Patrick’s hypocrisy when it comes to funding education for Texas children. And if that’s not enough for you, just listen to Dan Patrick speak for himself. He’s proud of the 2011 education cuts and even considers them an important credential for his TeaPublican bonafides. Leticia’s not making this up!! 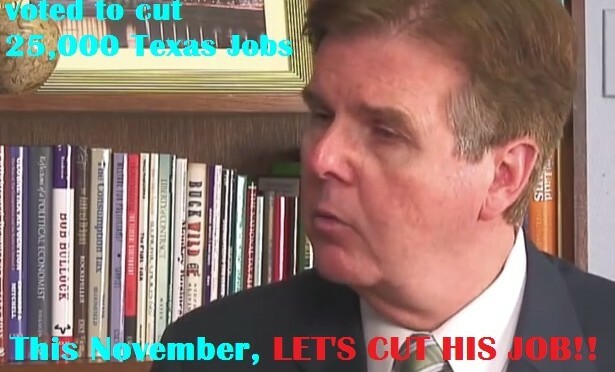 Oh, and by the way… Dan Patrick wanted to cut teacher salaries too. He says he wants school districts to be able to cut administrative jobs only, but admits that if they can’t reduce teacher salaries, then educators themselves will lose their jobs. And boy was he right on both counts. 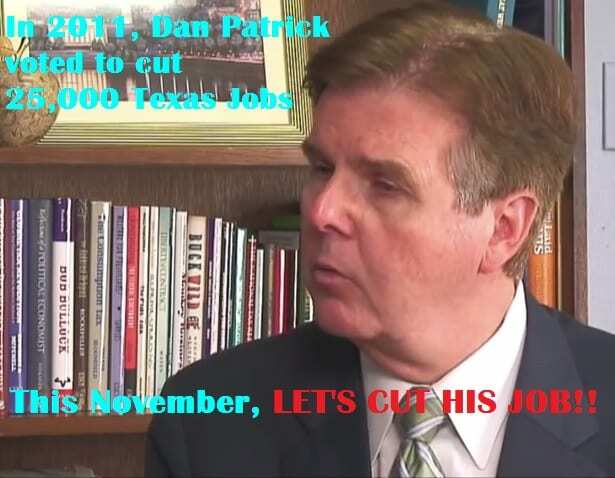 Thanks to the funding cuts Dan Patrick championed, over 25,000 Texans lost their jobs, more than 11,000 of which were teachers. Contrary to the Senator’s claims, Texas schools could not simply “get by” after the severe cuts of the 2011 legislative session. They lots so many jobs that over 600 districts are suing the state saying their funding levels are unconstitutional. 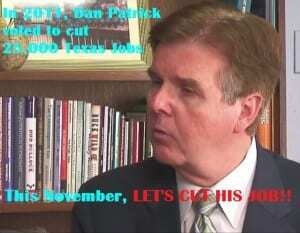 But thankfully this November, Texans have a chance to cut Dan Patrick’s job. One thing is for sure… we can’t afford to have him as Lieutenant Governor.